The head of Sweden's security service has told the BBC the agency is not just dealing with an increased threat of terrorism but also the impact of disinformation and fake news. Anders Thornberg, the director of the service (known as Sapo), says this year could be even busier than 2017 as the country prepares for an election in September. 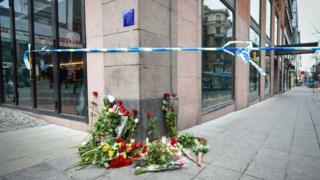 Terrorism remains high on the agenda after Stockholm was hit by a vehicle attack in April, which killed five people. A few years ago the service was worried about 200 extremists but now it has 3,000 on its radar whom it needs to evaluate. "We have never seen something like this before in my career in the service," says Mr Thornberg, a 30-year veteran of the service. Speaking to the BBC at his headquarters, he adds: "We have a new normal." The concerns are similar to those in the UK: returnees from Iraq and Syria, as well as the speed of radicalisation of those who have not left the country. Sometimes those who have had little or no contact with extremist circles are moving quickly towards violence, which can be hard to spot. International cooperation is vital in countering this threat, Mr Thornberg says. He does not believe Brexit will damage co-operation with the UK, but he confesses he was worried when he first heard about the referendum result. One concern he does have - and which he says is shared by fellow security directors across Europe - is a case at the European Court of Justice which might restrict the ability to retain data. "That is very, very serious if we don't get the information," he says, arguing it is a vital tool in tracing the contacts of suspects. "If we don't get the same as we have had in the last couple of years then we will have problems. I'm sure about that." The rise of the far right is also a major concern with bomb plots against refugees and other political parties disrupted recently. Those concerns are growing as Sweden prepares for its election. "We know with our knowledge and our experience from before that activities with political violence and threats will increase," says Mr Thornberg. Fear of foreign political interference is a newer concern though. "It's very important for us to follow this and we are not shy in Sweden - we say that the biggest threat to our security in that perspective is Russia," says Mr Thornberg. Russia lies just across the Baltic Sea but experts believe it is the debate within Sweden about whether to move closer to the NATO alliance which has made the country a particular target. Three years ago a Russian submarine was even spotted in Swedish waters; part of a pattern, some Swedish observers say, of intimidation, espionage and interference. Mr Thornberg says it is Russia's willingness to take risks and work long-term that makes it a particular concern. "We are preparing, we are learning, we are taking in information from foreign countries and from sister services and we are trying to prepare to protect the Swedish election," he says. Mr Thornberg gives a number of examples of disinformation, including letters about arms deals with Ukraine bearing the forged signature of the defence minister. In another case cited by Swedish officials, a faked news article about a former minister setting up a group to battle Eurosceptics, went on to be picked by Russian and British media - just weeks before the UK's Brexit referendum. Other stories, such as one claiming that Muslims had vandalised a church, were spread by automated social media accounts, known as bots, based outside the country - although it is hard to prove who was behind this. The aim often seems to be to create division and reduce trust and credibility (including in the media itself) rather than to push a particular viewpoint. "If they want to make uncertainty in our country they are doing that," says Mr Thornberg. He says Sweden has seen espionage and cyber-intrusions into the country's infrastructure from Russia and also China. Fake news is an increasingly talked-about problem and it can be created domestically, but Mr Thornberg says his service has a role when a foreign state may be behind it. Sweden's civil contingency secretariat, the MSB, has also been tasked with spotting disinformation. "What we are doing is looking at what information could affect the well-being of our population, the functionality of our society or could affect negatively our fundamental values - freedom of speech, democracy and individual rights," says Mikael Tofvesson, the MSB's head of global analysis and monitoring. Swedish society is trying to confront the threat of disinformation. Media organisations are supporting independent fact-checking and the government wants primary school children to be taught how to spot fake news. This year's election may be a test of how all of this works and Mr Thornberg argues that the relative openness of Sweden's security service is part of that strategy. "I think it's important for us as a security service to inform the public about the threat picture, so we have been putting a lot of efforts to do that," he says, pointing to the service's presence on Twitter. "Our first tweet on Twitter was "We are on Twitter because of security. Follow us because we follow you," he adds.